The Australian Constitution that ‘created’ Australia as a nation in 1901, prevented the new Australian Commonwealth government from legislating on Indigenous Affairs, a power the Constitution reserved for the lower tier of State governments. In 1967, an Australian Constitutional Referendum was passed, that granted, for the first time power to the Australian Commonwealth governments to legislate on Indigenous Affairs. This chapter examines almost fifty years of Commonwealth government involvement in Indigenous Affairs. 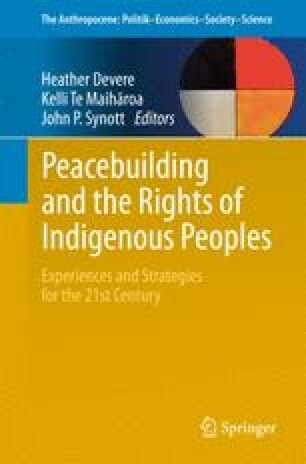 Specifically, the chapter examines Commonwealth government involvement in Indigenous rights, including self-determination, land rights and native title. The chapter argues that, overwhelmingly, the Commonwealth governments have failed to genuinely acknowledge and recognise these rights. Professor Andrew Gunstone, Department of Indigenous Studies, Swinburne University, Australia; Email: agunstone@swin.edu.au. His research interests include the politics of reconciliation and the history of stolen wages. His recent books include Developing Sustainable Education in Regional Australia (2014) (ed.) (Monash Publishing), Reconciliation in Regional Australia: Case Studies from Gippsland (2012) (ed.) (Australian Scholarly Publishing [ASP]), A Decade of Despair: The Howard Government and Indigenous Affairs (2010) (ed.) (ASP), The Government Owes a Lot of Money to Our People: A History of Indigenous Stolen Wages in Victoria (2009). He is the Founder and Editor of the Journal of Australian Indigenous Issues. Australian Broadcasting Corporation (ABC), “Call for unity on Parliament’s first day”; at: http://www.abc.net.au/news/2010-09-28/call-for-unity-on-parliaments-first-day/2276618 (15 September 2012). Australian Broadcasting Corporation (ABC), “Julia Gillard wants Indigenous people recognised in Constitution”; at: http://www.abc.net.au/pm/content/2010/s3060559.htm (15 September 2012). Australian Broadcasting Corporation (ABC), “Turnbull keeping Indigenous Advisory Council”; at: http://www.abc.net.au/am/content/2015/s4317947.htm (1 November 2015). Australian Broadcasting Corporation (ABC), “Indigenous leaders call on Malcolm Turnbull to reverse ‘disaster’ portfolio shift”; at: http://www.abc.net.au/news/2015-09-17/indigenous-leaders-call-on-turnbull-to-reverse-decision-on-port/6784954 (1 November 2015). Australian Broadcasting Corporation (ABC), “Senator Cory Bernardi warns ‘divisive’ Indigenous constitutional referendum ‘doomed to fail’”; at: http://www.abc.net.au/news/2015-05-21/senator-warns-against-divisive-indigenous-referendum/6485538 (1 November 2015). Australian Government, “Prime Minister’s Indigenous Advisory Council, About”; at: http://iac.dpmc.gov.au/about (1 November 2015). Castan, M., Constitutional Recognition: Two Steps Forward After One Step Back; at: https://theconversation.com/constitutional-recognition-two-steps-forward-after-one-step-back-46424 (1 November 2015). Coorey, P.; Davis, M., “Welcome Ritual Marks Opening of Parliament”, Sydney Morning Herald 13 February 2008; at: http://www.smh.com.au/news/national/welcome-ritual-marks-opening-of-parliament/2008/02/12/1202760301385.html (16 September 2012). Kildea, P., “Confidence Must be Rebuilt After PM Shoots down Indigenous Leaders’ plan”; at: https://theconversation.com/confidence-must-be-rebuilt-after-pm-shoots-down-indigenous-leaders-plan-45693 (1 November 2015). National Congress (National Congress of Australia’s First Peoples), “Concern over Impact of the Budget on Aboriginal and Torres Strait Islander Peoples”; at: http://nationalcongress.com.au/congress-2014-budget-response (1 November 2015). Rudd, K., “Apology to Australia’s Indigenous Peoples”, House of Representatives, Parliament House, Canberra, 13 February 2008; at: http://www.pm.gov.au/media/speech/2008/speech_0073.cfm (17 September 2008). Rudd, K., Press Conference Nhulunbuy, North East Arnhem Land, 23 July 2008; http://www.pm.gov.au/media/interview/2008/interview_0375.cfm (17 September 2008). Rudd, K., Press Conference Parliament House, Canberra, 28 January 2008; at: http://www.pm.gov.au/media/interview/2008/interview_0047.cfm (17 September 2008). Rudd, K., “Interview with Karen Middleton”, SBS TV News, Media Interview 20 April 2008; at: http://www.pm.gov.au/media/interview/2008/interview_0212.cfm (17 September 2008).